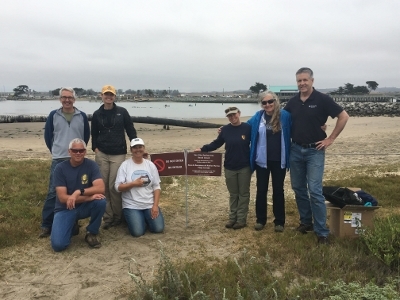 One fence + twelve signs + seven agencies + sea otter bachelors = the best sea otter haul out beach in California! The picturesque town of Moss Landing, California lies at the mid-way point between the cities of Monterey and Santa Cruz on Monterey Bay. It has long been known as one of the best places in California to view sea otters in the wild, and has several locations where those wishing to watch or photograph sea otters may do so from a safe distance for both sea otters and humans. Making this location even more special, is the opportunity to observe sea otter behavior that is not often witnessed: coming ashore to rest. While researchers have documented healthy sea otters coming ashore---a behavior known as hauling out--- in California, Alaska, Canada, and Russia, in populous California they often do so at hidden locations or at nighttime when they feel safe from disturbance by humans. At moderate tides when Jetty Beach, on the west side of Moss Landing’s north harbor, is exposed just enough to allow space for napping, observant viewers may spot some of the male sea otters from the nearby bachelor raft coming out onto the sand to groom their fur and rest. Why would these marine mustelids, adapted in so many ways to an aquatic existence, come out onto land where their movements are often awkward and slow? Researchers studying this behavior have found that, once on land, sea otters’ body temperature warms more rapidly and stays warmer longer than when they rest in the water. This means more time resting and less energy devoted to keeping their internal temperature stable in a cold-water environment. Access to safe haul-outs is especially important to sea otters that are food-stressed and struggling to meet their basic caloric requirements. Additionally, sea otters that are sick or injured may also haul out. A safe haul-out location for these compromised animals may mean the difference between life and death. 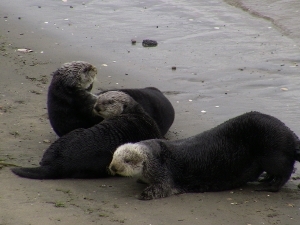 Beach goers approach hauled out sea otters at Jetty Beach. photo Brenda DutkiewiczThis opportunity to view this interesting behavior has a darker side. Sheltered inside the north jetty, Jetty Beach is a popular location for families, beachcombers, and kayakers to enjoy a beach experience that is relatively protected from the open ocean. Perhaps not understanding the harm, people are drawn to sea otters on the beach, their curious approach usually disturbing resting otters and scaring them into the water. On busy days, it is possible for every sea otter that attempts to haul out to be harassed by people. What is the harm? Sea otters that are disturbed and forced into the water waste vital energy, and lose the energy-conserving opportunity hauling out provides. Repeated disturbance of this kind can become very energetically costly. Chronic harassment may also result in habituated sea otters that have lost some or all of their natural fear of people. These bold sea otters can become aggressive and are capable of biting and inflicting serious injury. Direct contact can also come with the risk of transmission of disease (both to and from the sea otter) to people and their pets. By repeated encroachment for our own pleasure, we are depriving sea otters of the space all wild animals need to live healthy, less stressful lives. 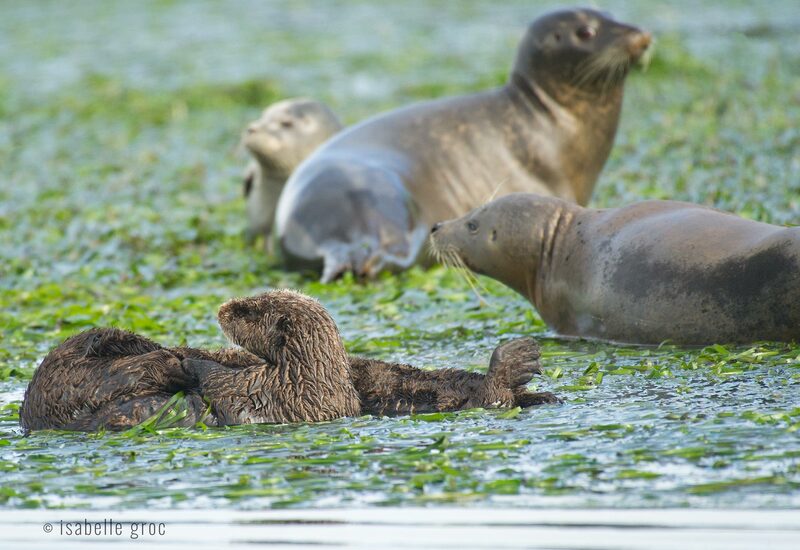 In spring of last year, the idea to set aside this important habitat for sea otters was first proposed. 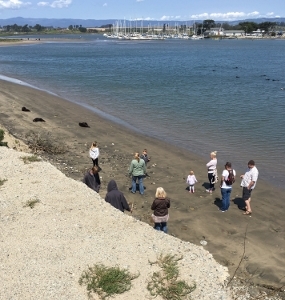 Reports of disturbance and harassment of hauled-out sea otters at Jetty Beach were increasingly frequent and the Sea Otter Cam of the “otter-centric” website, seaotters.com was recording incident after incident of hauled-out sea otters being harassed by people. 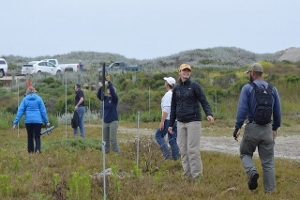 While the idea to close this beach to provide a safe haul-out for the sea otters seemed simple, the complexity of ownership of this small bit of land, required cooperation and agreement from a number of agencies and organizations. This process, while at times frustratingly slow, resulted in a Multi-agency work group on installation day. photo L Henkelsolution that was well worth the patience and effort: Jetty Beach now belongs to the sea otters, birds and other marine wildlife of Moss Landing Harbor. On Friday, June 30, 2017, many of those who had been working to make this happen, came out to take on the final task---installation of the fence closing the beach---together. It is our hope that the beach closure will make Jetty Beach even more appealing to sea otters seeking warm up opportunities on a sheltered sandy shore. 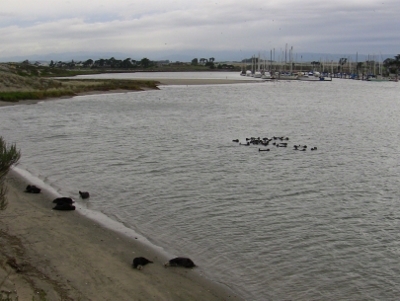 The sea otters of Moss Landing, whether in the water or on shore, may be readily observed from the parking lot near the end of Jetty Road. Just steps from your vehicle (and at a sea otter savvy distance) you may see and photograph sea otters just going about their "sea ottery" business. Come back again next year---I’d be willing to bet you’ll find even more sea otters on Jetty Beach taking advantage of a safe protected place to get the rest they need.